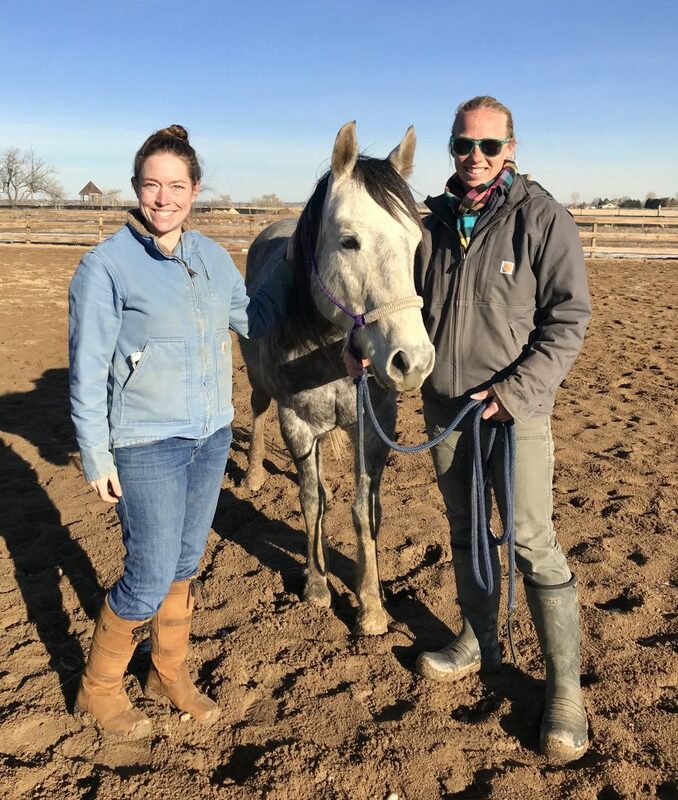 If you haven’t been following along, catch up on Odin’s story on the Colorado Horse Rescue website (here) and on our blog post from February 6 (here). Now on to the first training session we were able to attend. After only a few short months of training, Odin can be easily caught in a large paddock. As many pony owners can attest, this can be a feat in and of itself! With the added incentive of some alfalfa, he can stand fairly quietly to be gently fussed over. When I found JUST the right spot around his ears, he relaxed and leaned into the scratches. Once he learns to trust people, I predict the little guy will be quite the pocket pony! Odin still can be a little reactive and spooky, but he has a great brain and comes back incredibly quickly. He is still learning to be comfortable with having his back feet handled, but he is rapidly learning all the skills a solid citizen needs to master. This pony LOVES to jump. We set a small crossrail along the rail in the arena (this also became part of the training… can you keep it together if the person leading you is dragging a pole? Turns out the answer is yes!). Odin had the run of the entire arena, and with no input from any of us, zeroed in on that jump, and proceeded to run back and forth over it, with wild pony mane flying. This was no traditional free jump chute – just a lonely jump that he chose to leap over and over for the sheer fun of it. Now came the real moment of truth. Odin was having fun, and very animated as evidenced by snorting and a perfectly vertical tail flag. How quickly could she get him caught and back on task? Did I mention this pony has a GREAT BRAIN?! Sarah was able to walk right up to him, calm him with a hand on the neck, and slip the halter on. After a few snorts for good measure, he went right back to groundwork for a few more minutes. Though still very green, you can tell he’s a gem. We can’t wait to get out at the end of the month and see how much progress he has made!